STANAG Player/Recorder .NET SDK is an "ITAR-free" library that provides stream/file playback, capture and KLV extraction/decoding functionality. It helps developers to create applications that receive, record and play back streaming video coming from UAV platforms, extract the telemetry metadata (MISB 0601.X), process it in real time or archive for later retrieval and post-processing. The SDK has a rich feature set that can be easily customized, providing a robust and very cost effective solution for any STANAG 4609 related development project. 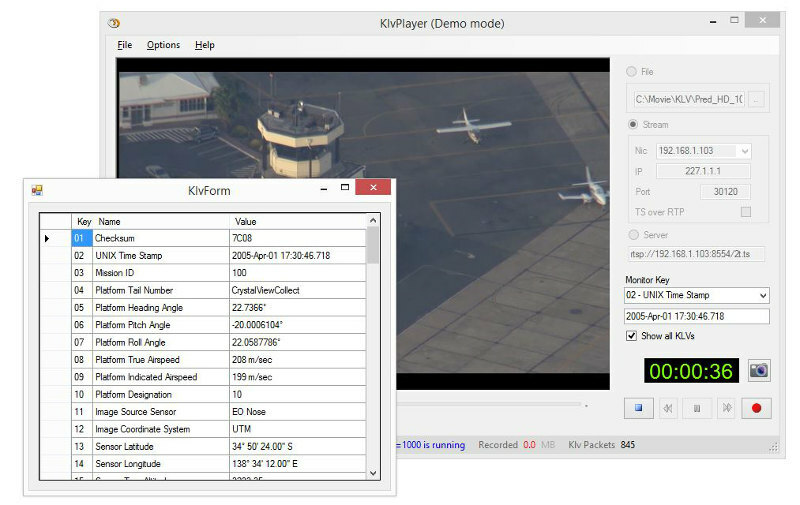 The applications built on top of ImpleoTV's STANAG Player/Recorder .NET SDK are deployed into a variety of civilian and military applications worldwide. STANAG 4609 / MPEG TS network stream playback (TS over UDP / RTP, configurable Nic/IP/Port). STANAG 4609 / MPEGTS file playback. STANAG 4609 VOD playback (RTSP, including trick mode** - Seek, Reverse, Fast Forward). MPEG2/H.264 payload + MISB 0601.X metadata support. On-the-fly metadata transcoding from EG0104.5 to MISB 0601.8. Demuxes, decodes and renders video using MPEG2/H.264 Direct Show decoder (built in or 3rd party). Decodes KLV payload and provides metadata packets as a list of KLV triplets. (automatic detection - priority list). Raw (uncompressed) video frames and Raw KLV data buffer callbacks. Records incoming stream into file (allows segmentation by size/duration). Impersonate Mode support (for execution under another user context, for Windows service development). Direct Show based (ability to integrate your own filters into the graph). Complete C# sample code (console application, Windows Forms and WPF). Please check out our new STANAG Player SDK.